Continuing their love affair with all things Social Media, Four Seasons Hotel in Boston, MA have launched a combined Facebook and Pinterest competition. To be eligible to win, entrants simply create a “Boston Fantasy Family Getaway” Pin to Win Board on Pinterest between July 10 and 30, 2012, with 10-20 pins representing their ideal Family Summer Vacation to Boston. However at least one pin on the board must be from each of the following: Four Seasons Hotel Boston, Boston Duck Tours, Georgetown Cupcake and the World’s Only Curious George Store websites. So it's not exactly your 'ideal' Boston break. 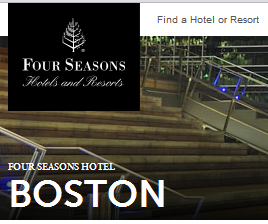 However, you next have to visit the “Boston Fantasy Family Getaway” tab on Four Seasons Hotel Boston Facebook fan page and submit contact details and the URL link to the entry for “Boston Fantasy Family Getaway” Pinterest Board. Entrants have to become a fan of Four Seasons Hotel Boston on Facebook to view the official contest details, and then simply start pinning to win.